New Delhi, Feb 13 (IANS) Veteran Samajwadi Party (SP) leader Mulayam Singh Yadav on Wednesday created a flutter in political circles when he heaped praise on Prime Minister Narendra Modi in the Lok Sabha and expressed his wish to see him re-elected to the office again. "I wish all the members of this Lok Sabha win again and return to this House. The Prime Minister has worked for everyone. He tried to take everyone along with him. I hope he returns as Prime Minister again," he said in his valedictory speech on the last day of the 16th Lok Sabha. Reacting to it, the Prime Minister acknowledged it with folded hands and later said "There is much to do to carry forward the development agenda. And Mulayam Singhji has given his blessings. I am very grateful to him." His comments came on a day when SP members led by Dharmendra Yadav, protested in the House against the lathicharge by Uttar Pradesh Police on party workers in Allahabad on Tuesday that forced a brief adjournment. Eyebrows were raised in the Opposition benches as Yadav's son Akhilesh has joined hands with SP's arch rival Bahujan Samaj Party (BSP) to oust Modi from power in the 2019 Lok Sabha polls. 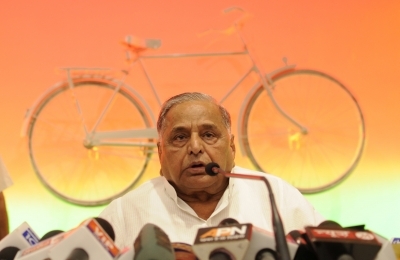 Reacting to Mulayam's praise, Congress President Rahul Gandhi said that he disagreed with him.